Ukulele is a string musical instrument originating from islands of the Pacific in 1880 thanks to Manuel Nunes. Vast majority of people associate this small guitar with Hawaiian music, beautiful melodies, sand beaches, palm trees and flower crowns. Partially it is true, since it is only after tours of artists from the pacific around the world did ukulele receive recognition. 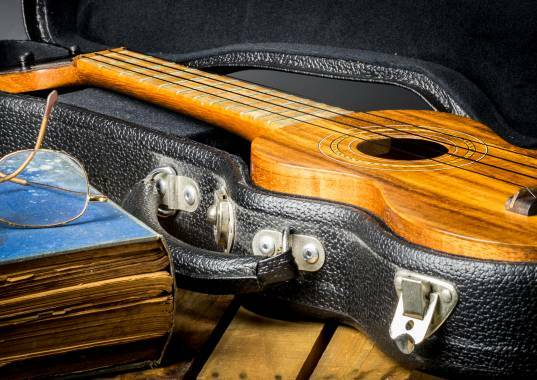 As strange as it might sound, ukulele has many advantages, making hundreds of musicians all over the world pick this very instrument. Surprisingly, its small size is ukulele’s advantage and not a detriment. Its modest size simplifies transportation and allows taking it practically anywhere. Ukulele has only 4 strings, which simplifies chords to an elementary level. For example C and AM chords are clamped with just one string, but in different frets. In just a few hours of practicing you can play simple melodies, and with regular exercises in just a month you can consider yourself an expert. Another indisputable strong side of ukulele is its low price. As I was just starting to get familiar with this instrument I was surprised by the fact that high quality models cost only about 2500 rubles (~45 dollars). It is without a doubt a great price for an instrument with such great potential. Soprano, the smallest out of them all, is the most popular one. I’m also a fan of this ukulele type as its sound is homely, warm and tender. The downside is the small fret size, which creates hardships for the newcomers, but they can be overcome with enough practice. Concert ukulele is bigger, therefore it resonates stronger, making sound louder and more saturated. Tenor ukulele is a good choice for people who can already play a guitar. Fret size of this ukulele type is similar to a regular guitar which makes it easy to learn. Baritone ukulele has a much lower sound. Some people refer to this instrument as a “pseudo-guitar” which is completely incorrect. Big size creates deep, velvet sound. Baritone ukulele is a great addition to any ensemble. Lastly, the bass ukulele. This type appeared only recently, and hasn’t yet received wide recognition. Having a shape similar to ukulele soprano and much thicker strings, it creates low sounds unlike any other. For beginners I would advise starting with soprano ukulele, as this is the type that creates melodies commonly associated with Hawaii, and you get exactly what you would expect from this instrument with your purchase. It’s interesting to know that just knowing 4 main chords: C, AM, F, G, allows you to play 70% of all songs ever written for ukulele. And final piece of advice for fellow ukulelists: despite the simplicity of the instrument, it’s impossible to get anywhere without constant practice, regular exercise and effort. It’s better to play for 15 minutes every day than 4 hours every month. Remember: А journey of a thousand miles begins with a single step.